A horror anthology centered on burials and funerals is a very interesting concept, with a wealthy potential for making the theme very scary. With fear of being buried alive popping right away into mind, a torment made by Edgar Allan Poe’s stories and the movie featuring Ryan Reynolds and directed by Rodrigo Cortés, “Buried”, even more frightening, “Pumpkins in the Closet – Burials” could pile up further nightmares related to the final road we are all inevitably going to take. “The Michael Ranft’s Treatise” (El tratado de Michael Ranft) by Miguel Puente Molins – On the Halloween night two friends go to the cemetery to dig out the grave of an alleged gipsy witch, one to prove the affirmations of Michael Ranft’s two hundred years old treatise on vampires, witches and living dead, one to prove the other wrong. There is nothing groundbreaking at the opening story of this anthology, but Miguel Puente Molins executes very nicely the subject of “The Michael Ranft’s Treatise”. An obscure, occult volume on dark matters always holds an appeal for me, but the author also creates some powerful imagery within his tale. The violent acts surrounding the death of the alleged gipsy witch are brutal, without descending into unjustified gruesomeness Miguel Puente Molins projects on the readers’ eyes images not easy forgettable through the brutal act that leads to the vicious suicide of the supposed witch. And the lack of an original twist for the end of the story is heavily compensated by the way the protagonist experiences the final event, even seeing rats as playful, sweet and pleasant little things in hope that they are the cause for the dreadful sounds surrounding him. “Death Certificate” (Certificado de defunción) by Manuel Osuna – Alfredo, an old undertaker who struggles to make ends meet, accepts the odd job of taking an unidentified man, dead by drowning, to the nearby cemetery. When in the middle of the night a winter storm prevents him from going further and the roaming wolves from the surrounding forest spook his horses making them bolt Alfredo faces an imminent death by freezing or by falling prey to the nocturnal predators. His only means for escape seem to lie on the dropped coffin from the runaway carriage. Manuel Osuna creates an excellent atmosphere within his story, besides the uncomfortable feeling left by the particularities of Alfredo’s job the extreme weather and the menace of the nocturnal predators generate an oppressive setting, working in the fullest. The end of the story is a bit predictable, but fortunately the situation becomes apparent well towards the finale, up to that point “Death Certificate” left me fumbling for the outcome of the tale, with plenty of room for satisfaction in the process. “How the Mayor Attended the Night Debate of Buddy, ‘the Gravedigger’” (De cómo el señor alcalde acude al debate nocturne de Buddy, “el Enterrador”) by Juan de Dios Garduño – Buddy, an underachiever preferring to work as the gravedigger and cemetery caretaker of his village, holds intellectual nocturnal debates in his home, but for the latest, concerning the merits of horror literature over the more conventional one, he needs to summon the presence of the mayor in support of his opinion. It is a shorter story, but all the pieces of its plot fall, nicely, into place right at the end. There is also a tint of humor in Juan de Dios Garduño’s tale and although that is of a dark shade it still works favorably for the story, adding it an extra interesting layer. “Important is to Start” (Todo es empezar) by Pedro Escudero Zumel – Samuel, the narrator of the story, recollects, twenty-three years later, his first day of work as one of the cemetery’s caretakers, when Antonio, the veteran occupant in a similar position, guides him through some of the tasks of his new job. Only some of them require more cold blood than Samuel imagines they would. I am afraid that I was not impressed by this story. Although the tale takes another approach of the anthology’s theme than the previous ones it does not manage to send a frightening feeling across. Yes, the protagonist comes face to face with something completely unexpected but his sense of terror left me cold and the danger he faces over his years on the job doesn’t leave the impression of menace I was left to believe it poses. “The Procession of the Mourners” (La procession de las plañideras) by Jorge Mulero Solano – A procession of mourners follow the bodies and spirits of 26 women, dead in an unknown, strange event, into the afterlife. I cannot pinpoint a specific plot within the very short span of this story, I can only say that some of mourners walking in this procession are the mythological virtues and there are a couple more references to Greek mythology. Although it is hard to define Jorge Mulero Solano’s story it still contains some powerful imagery. “The Junction of Music” (El cruce de la música) by Francisco Jesús Franco – The protagonist of the story kidnaps three girls he finds on the roadside following a car accident. “The Junction of Music” is told through the perspective of the main character holding a conversation with the three kidnapped girls while taking them to a secluded place within the woods and at the destination, although that is pretty much a monologue since the terrified girls have no direct part in the dialogue. This approach from Francisco Jesús Franco brings great fluidity to his tale. The character reveals his intentions early on, creating the sense of dread quickly, the readers, as much as the three kidnapped girls, are left to discover the manner through which he wishes to execute his plan only late in the story. The constant chattering is marked by sudden changes in the character’s attitude, sometimes very polite, sometimes angry, sometimes mocking, and throws a light on the terror behind his acts and motivation. The ordeal of the three girls unfolds also through little comments made when they have a certain reaction to something the protagonist says, these small glimpses on their responses to the fearful event looming ahead adding further dread to the story. “Harvest of Bones” (Cosecha de huesos) by José María Tamparillas – Lucas Cebrián inherits a small farm from his uncle but his efforts are rewarded only by very poor crops and a great number of buried human bones. He is unaware that the people from the nearby village bury their suicides on his grounds and when Lucas discovers that he suspects there is something connecting these burials and his miserable crops. 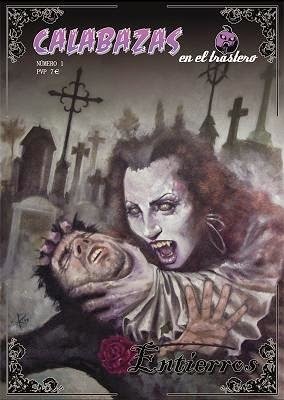 José María Tamparillas builds a deeply dark, haunting atmosphere throughout his story. Starting with Lucas, a character whose entire existence is full to the brim with misfortune, and continuing with the setting, spilling further mischance on Lucas’ already full of misery existence, “Harvest of Bones” is full of an unsettling feeling. This disturbing feeling and overbearing atmosphere starts to grow however, the constant presence of hot temperatures and humidity, the self-imposed isolation together with the suspicions and rejections Lucas faces from the villagers and the eerie events of the burial make the story even more chilling. The icing on the cake comes with the end of the story in form of a long and very powerful final scene, uncompromising imagery and high-voltage tension gathering around one sinister event. José María Tamparillas strikes a balance of uncomfortable images and bloodcurdling sensations making “Harvest of Bones” raise goose bumps on my skin. Very strong characterization and excellently built atmosphere make this story one of the best I read in recent times. “We Are Nothing” (No somos nada) by Laura Luna Sánchez – Assisting at the funeral of her friend the protagonist of the story makes comments on those attending it alongside her. Although the story touches on the theme of the collection it derails from its terrifying elements being more of a statement on hypocrisy and modern social status. It is also a very short tale, approximately matching the length of “How the Mayor Attended the Night Debate of Buddy, ‘the Gravedigger’”, but while that one delivers a punch through dark humor “We Are Nothing” doesn’t compensate in the same way. I am afraid that although its comment on modern society and some of the relationships born out of it is interesting the story misfires when it comes to the unsettling and disturbing aspects related to the anthology’s purpose. “Moroaica” (Moroaica) by Juan José Hidalgo Díaz – Sophia Smith runs a herbalist shop, but the other side of her business deals with more occult aspects. When a countess enters her shop and her servant calls Sophia a very strange word she feels that can find an answer, with the help of the countess, for the powerful dream that haunts her constantly. The title of the story rang a bell as soon as I read it, the moroi is an important part of the Romanian mythology. (It is believed that a baby dead before being baptized, killed or buried alive or a person buried without a religious ceremony can turn into a moroi. In other legens a moroi is the offspring of two strigoi, which are bad spirits of the dead.) The story proved that I was not wrong to think of that, “Moroaica” deals exactly with this element of the Romanian mythology and it does so with outstanding efficiency. Juan José Hidalgo Díaz clothes this legend with powerful scenes and shivering feelings, his story sent, more than once, ice cold bolts down my spine. Sophia’s bizarre dream, her visit to the madhouse and the story she hears there are highlights of this very good tale. The author also flavors “Moroaica” with dark aspects of the historical times in which the story is set, adding further dread through some harsh realities of those years. I loved Juan José Hidalgo Díaz’s deeply unsettling story not only for his excellent take on a Romanian legend, but also because it tackles the anthology’s theme with originality. “... And Avoid the Bad Thoughts” (… Y evitar los malos pensamientos) by Manuel Mije – An uncle and his nephew, both death and mute, go to a funeral in their village and on the road there they place little objects on the road. This story is a bit odd, but not in a bad way. It works in subtle ways and the outcome is left hanging in the air, without a straightforward conclusion. Among the other stories of this collection Manuel Mije’s tale is also the one leaving an optimistic feeling in its wake, but still using some of the sad facts related to humanity along the way. “An Empty Grave” (Una tumba vacía) by Juan Ángel Laguna Edroso – A young boy sneaks into the attic of his grandparents’ house to read his favorite comic books. A nice little story, with a catchy twist and a metafictional touch. It is not a spectacular story, but it emits that lovely vibe similar to a point to that of “Tales from the Crypt” vignettes. “They’ll Cry for You” (Y llorarán por ti) by José Ignacio Becerril Polo – A man wakes to find himself in the middle of one of the worst nightmares, buried alive. I guess for the main topic of this collection going at some point for the perspective of a buried was inevitable. However, what hurts “They’ll Cry for You” is José Ignacio Becerril Polo relating the story in first person, for me it took away some of the suspense and tension of the situation. The first person perspective let me believe the character will not end buried for good, otherwise how could his story reach out with the details only the buried protagonist could experience. Towards the end the author salvages something out of this through not one, but two interesting turns of the story. Unfortunately, as much as I appreciated the first, the second fell short from my point of view. Again it is the perspective nudging at me and also the fact that I believe the second twist has more to do with the soul than the body, which seems not to be the case here. “It’s My Job” (Es mi trabajo) by Sergio Mars – The village’s gravedigger is called to attend the latest deceased, but some dead put him to harder work than others. It is not the most memorable way to bring this anthology to a close, but “It’s My Job” matches in tone some of the feelings associated to final departures. The sadness of a loss, the difficulty of accepting a destiny that awaits us all, seen from both points of view, are interesting aspects of Sergio Mars’ story. Like I said, not the most memorable story of the collection, but quite fitted for its end. “Pumpkins in the Closet – Burials” is not an anthology where every story is a hit, but it has the merit of avoiding most of the pitfalls of its theme. With plenty of original tales, several strong writers and a couple of memorable stories “Pumpkins in the Closet – Burials” is a collection worth reading. Thank you for your review, I am so glad you liked my short story.